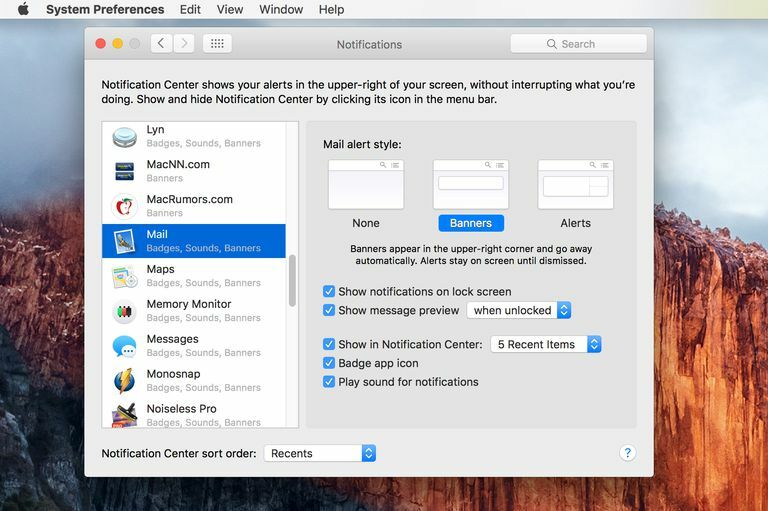 The Notification Center, introduced to the Mac in OS X Mountain Lion, provides a unified method for applications to provide you with status, updates, and other informational messages. The messages are organized in a single location that's easy to access, use, and dismiss. The Notification Center is an outgrowth of a similar service originally introduced on Apple's iOS devices. And since many Mac users have a wide collection of iOS devices, it's no wonder that the Notification Center in OS X parallels the one in iOS. Notifications appear in the upper-right hand corner of the Mac display. You can receive notifications from many sources, including your Mail app, Twitter, Facebook, iPhoto, and Messages. Any app can send messages to the Notification Center if the app's developer chooses to make use of this messaging facility. In most cases, developers seem to love to have their apps send you messages. Fortunately, you have control over which apps are allowed to send you messages and how the messages are displayed in the Notification Center. Launch System Preferences by clicking the System Preferences icon in the Dock (it looks like a sprocket inside a square box), or by selecting System Preferences from the Apple menu. In the System Preferences window that opens, select the Notifications preference pane located in the Personal section of the window. The Notifications preference pane has two major areas. The first is a sidebar that contains a list of apps that are "In Notification Center" as well as a list of apps that are "Not In Notification Center." In other words, these lists show you which apps are allowed to send messages to you (In Notification Center) and which apps you've restricted from sending messages (Not In Notification Center). The other section of the Notifications preference pane displays configuration options for the app that is selected in the sidebar. Applications that you have installed on your Mac that have the ability to send messages to the Notification Center are automatically enabled and will appear in the sidebar's "In Notification Center" section. You can prevent apps from sending messages by dragging the app to the "Not In Notification Center" section of the sidebar. If you have a lot of apps installed, you may have to scroll down to see the "Not In Notification Center" area. If you decide you would like to receive messages from an app that you have placed in the "Not In Notification Center," simply drag the app back to the "In Notification Center" area of the sidebar. You can also place a check mark in the "Show in Notification Center" checkbox. There may be times when you do not wish to see or hear notifications alerts or banners, but still wish for the notifications to be recorded and show up in the Notification Center. Unlike the app specific options of turning notifications off, the Do Not Disturb option lets you set a time period when all notifications are silenced. Select Do Not Disturb from the left sidebar. A list of options will be shown including setting a time period for enabling the Do Not Disturb option. When the display is sleeping. When mirroring the display to TVs and projectors. That last option will only display a call notification of the same person calls two or more times within three minutes. You can control how messages are displayed, how many messages from an app to show, if a sound should be played as an alert, and if an app's Dock icon should show how many messages are waiting for you. Notification Center options are on a per app basis. To set the various options, select an app from the sidebar. You can then apply one or more of the options listed below. Apps don't all offer the same display options, so don't be concerned if the app you wish to configure is missing one or more of the options. None: The selected app's messages will not appear onscreen, however, they will be visible if you manually view the Notification Center. Banners: An app's messages will appear on your screen and then automatically go away after a short time. Alerts: When you receive an alert style of message, the alert will stay on your screen until you dismiss the message or perform some task outlined in the message. An example of an alert message is when Apple notifies you of system updates. The message stays on the screen until you either dismiss it or open the Mac App Store to download the updates. Show in Notification Center: You can use the drop-down menu to select the number of messages (1, 5,10, or 20) that will be remembered in the Notification Center. Badge app icon: Place a check mark in the box if you wish to have an app's Dock icon display the number of current messages it has sent to the Notification Center. Play sound when receiving notifications: If you would like the Notification Center to announce a new message with an alert sound, place a check mark in the box. Sort Notification Center: The last Notification Center option is a global one, affecting all messages sent to the center. You can use the drop-down menu to select by Time or Manually. Selecting by Time will display messages according to when they were received. If you select Manually, messages from the same app will be grouped together. You can control the order of the groups by changing the order of the apps in the sidebar. Simply drag the apps to the order you would like to see the messages displayed in.